Ms Shiftlet efficiently checked the computer. "I see someone just had a birthday." "It was your birthday?" Noah demanded. Blue struggled to address the counsellor instead of Noah. "What - oh - yes." It had been two weeks ago. 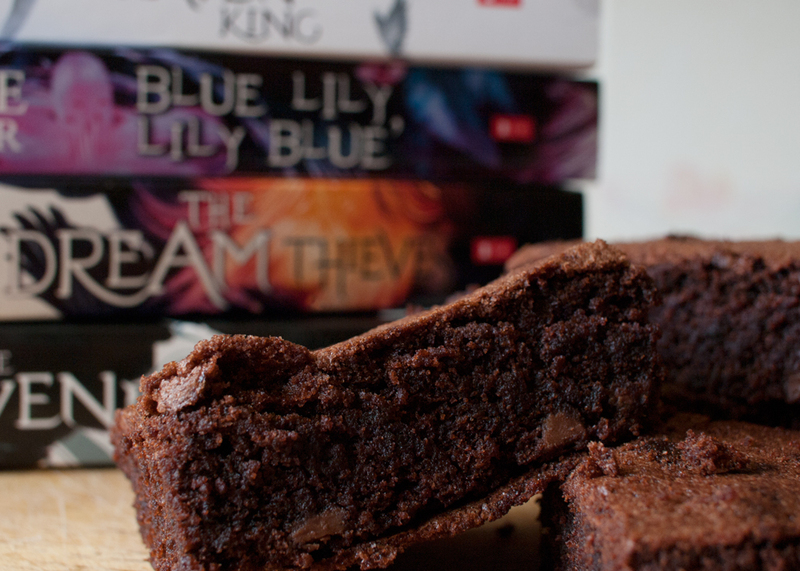 Ordinarily, Maura made sludgy brownies, but she hadn't been there. Persephone had tried her best to re-create their undercooked glory, but the brownies had accidentally turned out pretty and precise with powdered sugar dusted in lace patterns on top. Today we're doing something a little different. 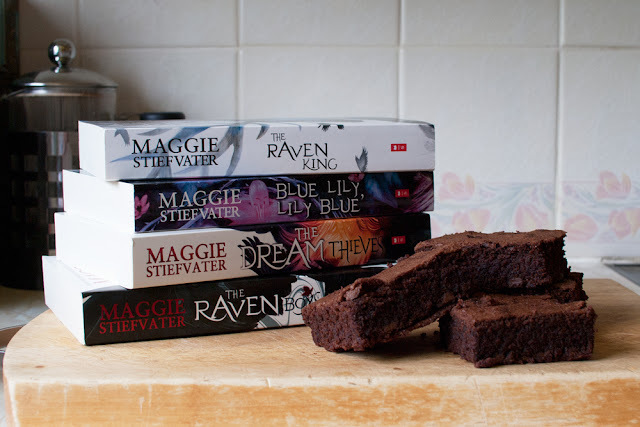 I'm sharing a recipe with you from one of my favourite book series, The Raven Cycle by Maggie Stiefvater. The Raven Cycle follows a teenage girl called Blue and her friends, four boys from the local Aglionby Academy, on their search for an ancient Welsh king. In the second book in the series, Blue Lily, Lily Blue, Blue reminisces about the 'sludgy brownies' her mother usually makes for her birthday and while I can't do anything about Blue not getting the brownies she wants, I can make sure you do get them. With a little work of your own, obviously. So here's my fail-safe, never-goes-wrong recipe for Maura's sludgy brownies, best enjoyed with a side of The Raven Boys. Preheat the oven to 180C/fan 160C/gas 4 and grease and line a large baking tray. Chase the raven out of the kitchen. How did she get in here? Beat the sugar and butter together before adding the other ingredients and beating until combined. Spoon the mixture into the prepared tin, spread it gently into the corners of the tin, and level the top. Tell the ghost who keeps trying to eat the batter that he'll have to wait until the brownies are done like everyone else! Bake in the pre-heated oven for 40-45 minutes until the brownies have a crusty top and a skewer inserted into the middle comes out clean. If the mixture is browning too much then cover it loosely with tin foil for the last 10 minutes. Leave to cool in the tin before cutting into delicious sludgy brownies. 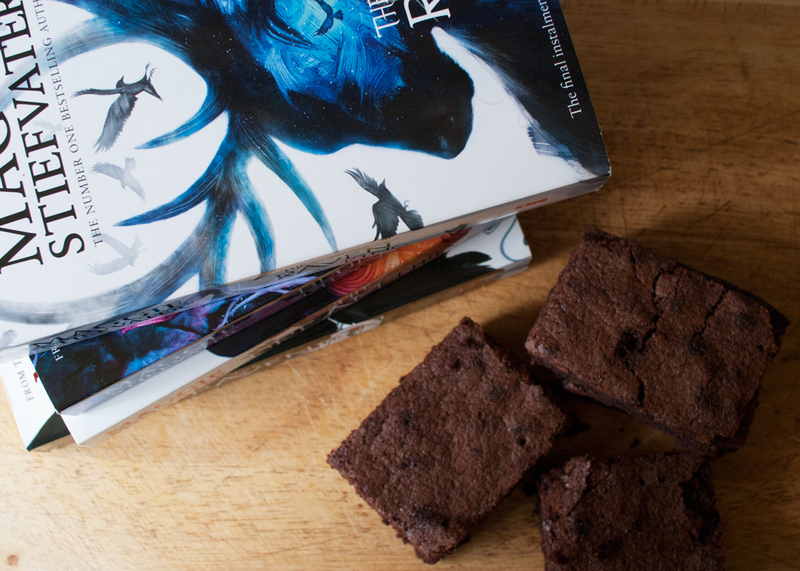 Pop your brownies in an airtight container and they make the perfect snack to share with friends while you're out searching for ley lines! *Recipe from Mary Berry's Baking Bible. Mostly.